The hype surrounding the initial public offering has reached a fever pitch as investors look for any updates about the Alibaba IPO date, IPO price, and the company's financials. But one thing that investors have already learned through the IPO process is that Alibaba has an unorthodox corporate structure – and it's one that will keep power firmly in the hands of the company's founders. In fact, the way that Alibaba will decide its board of directors will be very different from what most American investors are used to. Alibaba Group Holding Ltd. (NYSE: BABA) has 27 partners that will do most of the nominating when it comes to members of the e-commerce company's board. From there, shareholders will vote on who makes the final cut. Many of Alibaba's biggest shareholders – including Yahoo Inc. (Nasdaq: YHOO), which owns a 24% stake in the company – will be required to vote in favor of those nominated by the 27 partners. The combined shares of Yahoo, Executive Chairman Jack Ma, Executive Vice-Chairman Joseph Tsai, and other major shareholders will represent a near majority, thus all but guaranteeing those nominated by the 27 partners will end up making the board of directors. "[W]e expect the Alibaba Partnership nominees will receive a majority of votes cast at any meeting for the election of directors and will be elected as directors," Alibaba said in its prospectus. 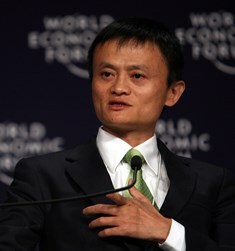 For their part, Alibaba has been very open about the lack of voting power retail investors will possess. "This governance structure and contractual arrangement will limit your ability to influence corporate matters, including any matters determined at the board level," the company said in its IPO filing.